Last year, several transportation options made getting to FHNY easy. Check back here for transportation information regarding the Dec. 31, 2018 event. Getting to downtown Columbia, SC from out of town for NYE weekend? Here are some driving directions from nearby big cities. It’s New Year’s Eve. Park your car and leave the driving to us! We’ll get you there safe and sound and return you at your convenience to your car without the hassles of traffic and parking. See below for bus routes that will be running during FHNY and download The COMET app to track your bus route in real time. For just $3, you will be able to take unlimited rides on The COMET buses to and from FHNY. Buses will be operating beginning at 6:00 p.m. December 31, with the last pickup at 1:30 a.m. January 1 at Sumter St. and Lady St.
On your first bus of the day, you can purchase a pass. Note: cash only is accepted on the bus! On the Catch The COMET smartphone app here. At the main downtown Transit Center at the corner of Sumter and Laurel Streets. Cash, checks and major credit/debit cards are accepted there. 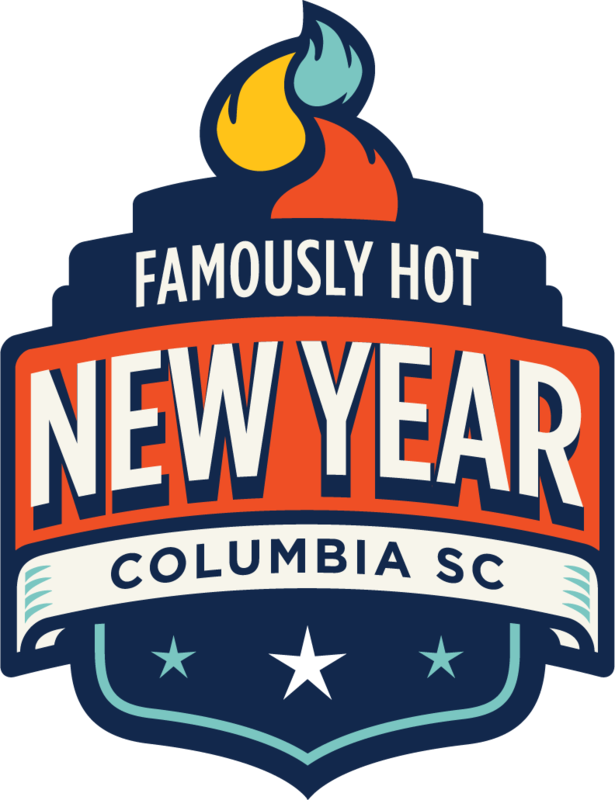 We're expecting thousands (including you) to join us in downtown Columbia for Famously Hot New Year. 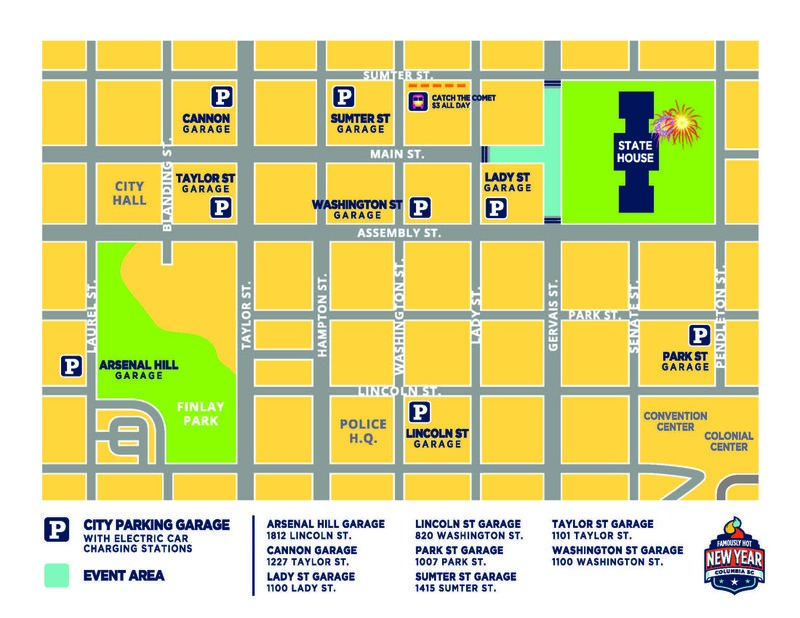 Downtown Columbia will have plenty of parking in our garages, but there is no annual event as large as #FHNY. Take the less stressful route to the street party of the year and hop on The COMET. The bus will run routes across the Midlands beginning at 6:00 p.m. December 31, with the last pickup at 1:30 a.m. January 1. The COMET leaves Sumter St. and Lady St. at the bottom of the hour – on the 30 minutes. Use the app to see when it's coming to your closest bus stop. Note: While all normal stops will be visited, The COMET will not come to a stop unless there are guests waiting. Not near one of these bus routes? Check out these park-and-ride locations below. For just $3, you will be able to ride any of The COMET buses to and from FHNY. Buses will be operating beginning at 6:00 p.m. December 31, with the last pickup at 1:30 a.m. January 1 at Sumter St. and Lady St.
Park-and-ride locations are stops on the bus route listed below. Download The COMET app to track each bus in real time. It's NYE. Have a good time, but be responsible. If you've had a few drinks, leave your car behind and let us get you home safely. KW Beverage, a locally owned and operated beer distributer, and Checker Yellow Cab have once again partnered to offer a safe, free ride from the event. Through the “Alert Cab” Free Ride Home Program, individuals can get home safely by receiving $10 off their ride home with Checker Yellow Cab. The designated area for cab service is on Lady St. at the corner of Sumter St. Please call 803-799-3311 and let them know that you're an Alert Cab rider. Please note that some restrictions may apply. Citywide on-street meter operations will also be complimentary on Tuesday Jan. 1, 2018. Guests are encouraged to take a safe ride home via special COMET bus service, Alert Cab sponsored by Budweiser and KW Beverage, or other means and may leave their vehicles overnight in the above mentioned City of Columbia garages for pickup on New Year’s Day. Plan to bring cash for parking at other City of Columbia garages. Famously Hot New Year takes place on the 1200 and 1300 blocks of Main St., between Gervais St. and Washington St. and extends to the 1100 and 1200 blocks of Gervais St. between Assembly and Sumter St. and the 1100 and 1200 blocks of Lady St.
Lady Street Garage, 1100 Lady St.
Washington Street Garage , 1100 Washington St.
Taylor Garage, 1101 Taylor St.
PJ Cannon Garage, 1227 Taylor St.
Sumter Street Garage, 1415 Sumter St.
Lincoln Street Garage, 820 Washington St.
Arsenal Hill Garage, 1812 Lincoln St.
Park Street Garage, 1007 Park St. The COMET is our fabulous regional transit system which has extended its operating hours for transporting Famously Hot New Year attendees. They will operate routes and pick up and drop off at park-and-ride lots throughout the Midlands the night of the event. Want to know more about The COMET transit system? Check out their website. Even better, download their app and track your bus route in real time!